Good Morning Lovelies! I have a new recipe for you today. About time right? I feel like it has been forever since I shared a recipe here. Last night the red heads and I were craving something yummy for dessert. We had eaten leftovers for dinner and needed a little special something to sweeten up our day. I went to my pantry and got out our coconut oil, rice krispies, and marshmallows. Yumminess in the making! I used coconut oil in place of the traditional butter you would find in krispy treats. I love coconut oil, since it is so versatile. I use it now for everything. It can replace butter in recipes and is great to use in place of sprays (when greasing your pans). I will have to do a post on this soon. If you don't have coconut oil, you can use margarine or butter. Ready to make some pure sweetness? 5 cups rice krispy cereal. Place coconut oil and marshmallows in a pot. Cook on low heat, until marshmallows have melted. Add cereal. Stir to combine and then place in a greased 9x13 baking dish. * I brush my pans with coconut oil. It is a healthier alternative to the sprays. * To flatten my krispy treats, I use the back of a spatula (brushed with coconut oil). 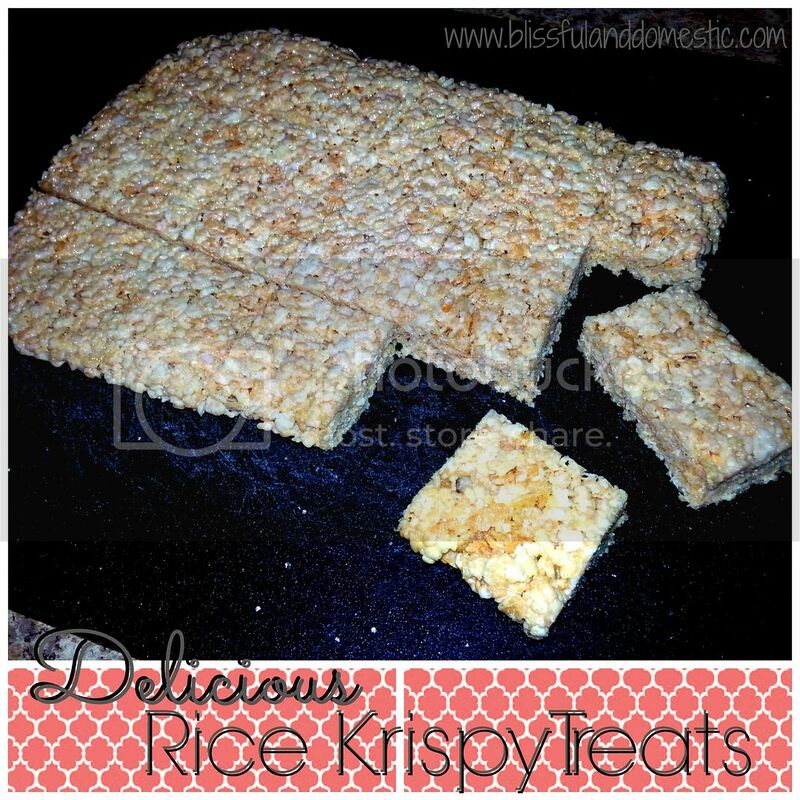 Enjoy your rice krispy treats today! I feel like I should've known that about coconut oil. Is it a one for one substitution with butter? I'm going to have to try that in more of my baking. Thanks! Yes its a one for one substitution. Hey! I found you via your living with $14,000 a year story and I was/am addicted to your page. Because of one of your posts about a food co-op (I can't remember if you mentioned Bountiful Baskets or just co-op) either way I went to Google to see what this was about. It was then in February I found Bountiful Baskets and I have been contributing EVERY SINGLE week since then. I take my boyfriend and my daughter with me every weekend to volunteer as well. I can't thank you enough for mentioning a co-op. I wish I knew this existed a lot sooner LOL! I didn't see where I could contact you directly so I'm posting here! Thanks again! Hola! I found you via your living on a $14,000 budget story and fell in love with your blog. In one of your posts you mentioned a co-op. So I took to Google and found Bountiful Baskets Food Co-Op. I'm SO blessed you mentioned it and I can't thank you enough! I've been participating since February and volunteering every Saturday morning. I even take my kiddo and my boyfriend along. Such a great bargain and wonderful add on's! (PS they randomly have coconut oil). I wish I knew about BB sooner LOL. Thanks again! Nice, I almost always have a pan of RCTs in the kitchen!